OVTP is excited and pleased to announce the Heritage Trail upgrade has and is happening. OVTP in cooperation with the City of Wheeling is working to patch cracks on the trail. The City has repaved 2 portions of the trail and a third section is scheduled. OVTP has funded treatment of 6 bridges on the Heritage Trail. OVTP purchased a bicycle repair station and had it placed by City of Wheeling beside the Trail and Wesbanco Arena. Under the leadership of Jesse Mestrovic, Wheeling City Manager of Parks and Recreation, four Wheeling playgrounds have been upgraded and finished. More are planned. Ohio Valley Trail Partners is happy to share the good news of maintenance of our important outdoor spaces. Progress toward completion of the last 7-plus miles of trail in Brooke County, WV, to complete the 430 approximate miles of trails stretching from Wheeling to Washington D.C. is in the works. The 7-plus miles are divided into 4 phases. 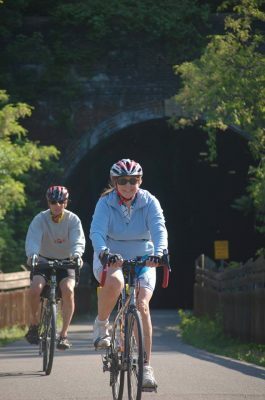 Four regional trail groups are involved: OVTP, Brooke Pioneer Trail Association., for Phase I, Follansbee Trail Committee for Phase II, and Panhandle Trail Committee -Weirton- Phase IV. In East Ohio, Belmont County, led by the Ohio Valley Trail Association, is making strides to develop trails. Goals are to connect to neighboring counties and cross the Ohio River to the Wheeling Heritage Trail. The Wheeling Heritage Trail Improvement Project is a fundraising program to help the City of Wheeling repair damaged areas of the trail. OVTP will match donations of any amount from citizens until we reach $5,000. The City of Wheeling will then match our total donations. We are confident that we will make the Wheeling Heritage Trail a 5 star trail system again. Ohio Valley Trail Partners is a 501c3 tax exempt organization. Donations can be mailed to Ohio Valley Trail Partners, P.O.Box 2001, Wheeling, WV 26003.